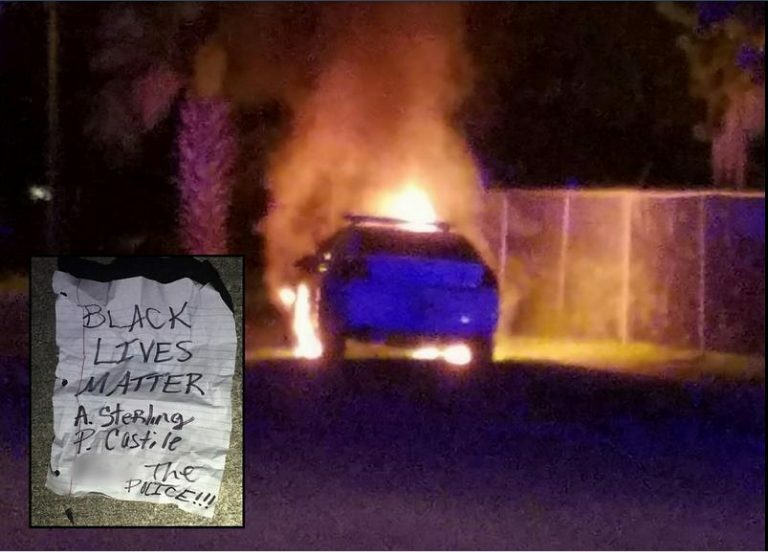 Daytona Beach – a police vehicle parked near a mosque in Florida was firebombed on Sunday, and an ominous note left behind. Daytona Beach Police had been stationing a police unit near the Islamic Center at 347 S. Keech St. since the Orlando attacks in case anti-Islamic hatred might be directed at them. The car was a “ghost car” and not occupied at the time. Police Chief Mike Chitwood told reporters that though he was unclear what caused the blaze, he assumed it was a Molotov Cocktail. Residents said that the car was fully engulfed prior to the fire department’s arrival. Damage to the car was estimated at over $20,000 – totally destroyed. The Chief cautioned against assigning blame just yet. Chitwood said those responsible would likely face arson charges as well as damage to a police vehicle if apprehended. Despite the sign implicating the Black Lives Matter organization, Chitwood said he had not yet concluded that the firebombing was the actual work of anti-police protesters. Police are investigating the incident and there are no suspects or persons of interests, but detectives are reviewing surveillance video in the area, he said. Chief Chitwood, describing Black Lives Matter’s actions as a “wedge” is a total understatement.